A question every school librarian must face is, to cover? or not to cover? In plastic. For our new library, I choose to buy hardcovers whenever possible -- only adding a plastic layer to books with dust jackets where the jacket alone carries a front cover image (i.e., when the hardcover itself is plain). Any paperbacks I buy are being left as is. No sticky-back plastic -- of any kind. It's a decision of cost -- of the plastic, of the labor spent attaching the plastic, and to the environment which must live with the plastic for its lifetime. A similar question every school/teacher must face is, to laminate? or not to laminate? 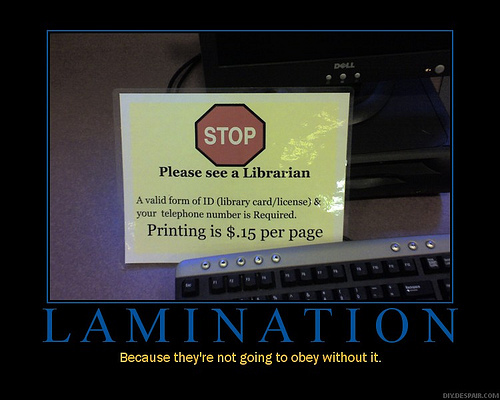 My friend Pam Duncan, a head librarian in control of the school's laminating machine, has single-handedly managed to significantly reduce her school's plastic footprint by insisting staff justify each and every act of lamination to her personally. I've wondered if lamination and similar protective techniques in libraries don't encourage the very disaster they anticipate—"Oh, the book has a plastic cover on it? I guess that means its okay if I read it while eating a meatball sub!" On the other hand, books may rapidly become completely recyclable so when that meatball sub falls onto it, you just pop it in the back of the "recycler/fabricator" that we'll have in our homes -- and produce a new copy (or print out a different book). Witness the all-plastic, waterproof, completely recyclable book, Cradle to Cradle: Remaking How We Make Things, a manifesto calling for ecologically intelligent design. To eliminate the concept of waste means to design things -- products, packaging, and systems -- from the very beginning on the understanding that waste does not exist. Intentionally recyclable physical books aren't that prevalent yet, though we do have the ability to print and bind paperback books from scratch in minutes, via machines like the EBM (Espresso Book Machine) -- at a cost of a US$0.01 per page. The Espresso Book Machine -- in action! Which brings me to Brewster Kahle, the inventor, philanthropist and digital librarian, who is trying to bring everything ever published to anyone who wants it -- universal access to all knowledge. He's working to digitize all the texts of the world and, because he still likes the old-fashioned technology of "the book", he's experimenting with machines like the Espresso Book Machine in places like rural Uganda -- to bring books to people who need/want them. Listen to him talk about his various projects at TED in December 2007. Want to read more about the future of books (and publishing and writing)? First, subscribe to if:book, the blog of the Institute for the Future of the Book. Second, you might enjoy reading "The 21st Century Writer" and the accompanying interviews of Tim Reilly, Douglas Rushkoff, Stephen Abram, and Frank Daniels, published in The Futurist (July/August 2008 issue online). I always thought that publishing was about, first of all, understanding what matters, figuring out how to gather information and then gathering readers who that information matters to. There’s a kind of curation process. What the Internet has done is bring us new methods of curation. "The single most important condition for literacy learning is the presence of mentors who are joyfully literate people." -- according to Shirley Brice Heath, professor of linguistics and English and linguistic anthropologist. What a wonderful phrase -- joyfully literate. Which makes me think of books about literacy which have made me feel joy over the past year. 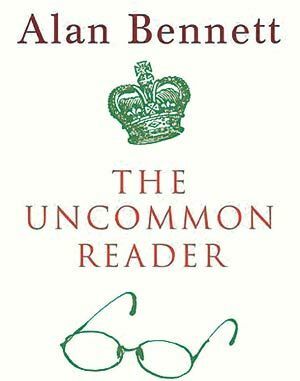 Fiction choice: The Uncommon Reader, by Alan Bennett -- a short, humorous fantasy in which the Queen of England stumbles upon a mobile library behind Buckingham Palace and out of politeness and duty starts to take books out -- and how it changes her life. Of course, at first she's not impressed, but slowly she gets hooked and moves up the ladder of literature. When she later goes back to re-read that first novel, she finds it quite easy and interesting. And it occurred to her (as next day she wrote down) that reading was, among other things, a muscle and one that she had seemingly developed. This is the point of my favorite non-fiction literacy book of 2008. The heart of the expert reading brain is to think beyond the decoded words to construct thoughts and insights never before held by that person. In so doing, we are forever changed by what we read. The acme of the reading brain is time to think. So simple, so powerful. A system that has become streamlined through specialization and automaticity has more time to think. This is the miraculous gift of the reading brain. Time to laugh, time to hear the author's voice, time to listen to the voice in your own head. As Wolf points out, the evolution of writing provided a cognitive platform for other skills. It is not reading directly that caused all these skills to flourish, but the secret gift of time to think that lies at the core of the reading brain's design was an unprecedented impetus for their growth. She touches a bit on the implications of online reading and changes to come, but not enough. It's a hot topic. 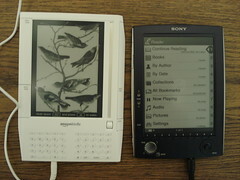 In July 2008 the New York Times published the first in a series of articles looking at how the Internet and other technological and social forces are changing the way people read. See Literacy Debate: Online, R U Really Reading? To accompany it, they also set up a Web Extra: Further Reading about Reading, with links to other interesting articles, such as Slate magazine's Lazy Eyes: How We Read Online (June 2008) and The Atlantic Monthly article in the July/August issue,Is Google Making Us Stupid? : What the internet is doing to our brains. More recently, the Chronicle of Higher Education weighed in with Online Literacy is a Lesser Kind: Slow reading counterbalances Web skimming, which argues that "we must recognize that screen scanning is but one kind of reading, a lesser one, and that it conspires against certain intellectual habits requisite to liberal-arts learning."